Fashion dictates to your wardrobe and with the help of Benjamin’s fine staff of tailors, your hems will always be in style. We are proud to serve you and meet the demands of turning your closet items into the most popular standards of the day. Our staff is prepared to alter your pants and give you the break you want or re-style your skirt length to fit your needs. 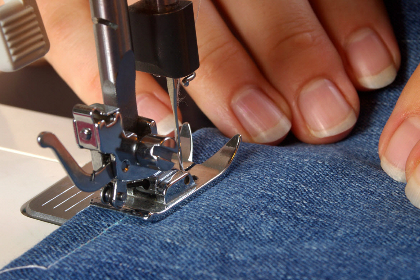 At Benjamin’s in Pampano Beach, our staff is prepared to offer you the finest in hem alterations. Altering a hem is a tedious job, but when you let our professional tailors do the work, you free yourself of the pain of measuring and the frustration of the sewing. Benjamin’s employs a staff of alterations experts who will measure the hem and ease your mind allowing for the perfect fit. Shortening a pant leg often requires the leg to be slightly tapered…that job is no problem for the tailors and seamstresses who are talented and professional. It is hard to part with any wardrobe item that is a favorite. Its only flaw is the out of date hemline. Altering a hem will bring that fashion a fresh and stylish look. We will eliminate the flaw. When purchasing a new dress or a formal gown for your special event, remember that our staff of tailors and seamstresses are more than capable of providing the right look and feel at the hemline…your style and comfort is paramount to us. The hemline is an important feature of any garment. We feel that your personal preference is the most important factor we can achieve when altering a hemline for you. Some men like a break in the pant leg while others do not and the latest in fashion takes the break and the length out of the pants. Whichever you prefer is our most important task at Benjamin’s. Correctly altering your hem is in our scope of expertise. Fashion revisits with styles from the past, so bring those wardrobe items to Benjamin’s in Pompano Beach and we will put you in the scene with the updated hemline you need to express your style.